Spokesman Simon Parker said: “The evening’s entertainment will be provided by the Lancing & Sompting Concert Band, The Chichester University Big Band, As We Are Band and vocal performances from various West End Singers. 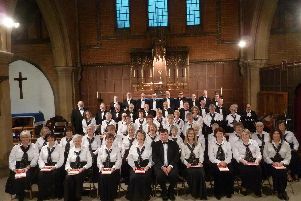 “The Lancing and Sompting Concert Band is one of the south’s leading concert bands who have been together for many years and continue to grow. Under the direction of James Lelean, they rehearse in the local community and are preparing for their tour in May. The band regularly gives concerts across the county, performing a wide range of music from rock and pop, to classical and musical theatre. “The Chichester University Big Band is a student-based band, made up of musicians studying one of the many music degrees on offer at the university. “The band meets weekly and brings their skills to the rehearsals that have been taught by their individual tutors to perform swing, pop, Motown, jazz, and many other genres of music. “The As We Are Band are from Lancing, and are all in Year 13 studying Level 3 BTEC music performance at the Sir Robert Woodard Academy. Formed in 2016, this nine-piece band perform original songs and covers across a variety of genres. Simon added: “Help for Heroes provides support to both serving and veteran members of the armed forces who have suffered life-changing injuries or illnesses, and their families for life. “Come along to our Help for Heroes charity concert. It promises to be a great evening with some amazing bands and stunning West End singers. Help for Heroes offers comprehensive support to those who have suffered life-changing injuries and illnesses whilst serving our country. Tickets for the Help For Heroes charity concert are available from the Worthing Theatres box office on 01903 206206 and online at worthingtheatres.co.uk.